By far my favorite sweet treat is ice cream and I firmly believe it’s never too cold to enjoy it. With all the amazing flavors that are available from so many different brands there is always something new to try. 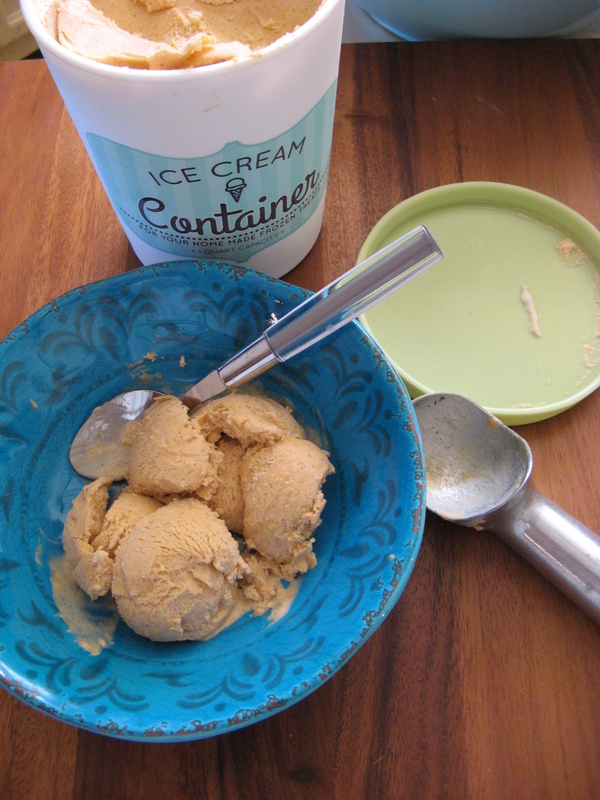 It’s been a while since I have made my own ice cream using my Cuisinart Ice Cream Maker but recently the idea of making Pumpkin Ice Cream began floating around in my head. And since I always have a can or two of canned pumpkin puree sitting in my pantry I finally got around to making it and I only wish I had it made it sooner. It was that good! 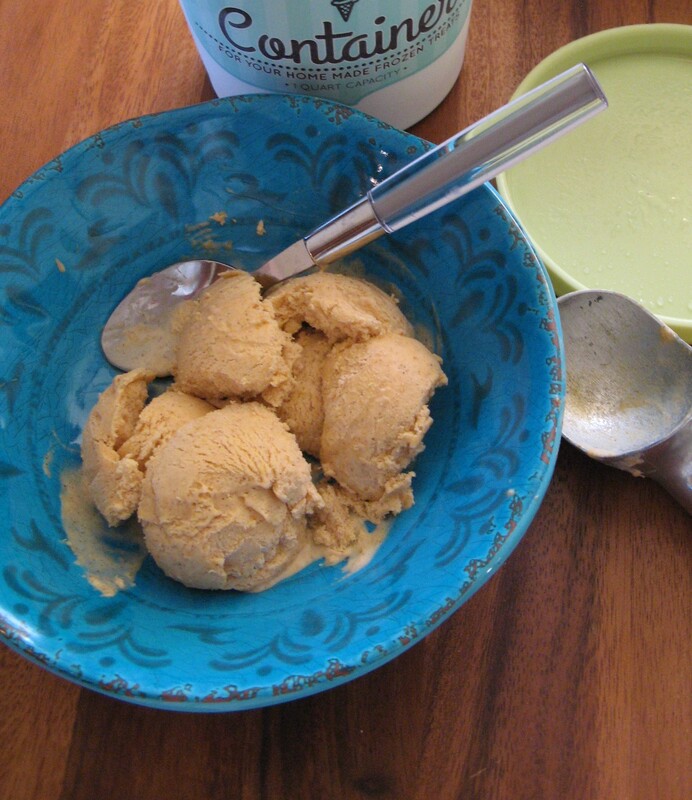 To create this ice cream I used an electric mixer to blend together whole milk, heavy cream, sugar, salt, vanilla extract, pumpkin pie spice and pumpkin puree until the sugar was dissolved. I then covered this mixture and refrigerated it overnight. 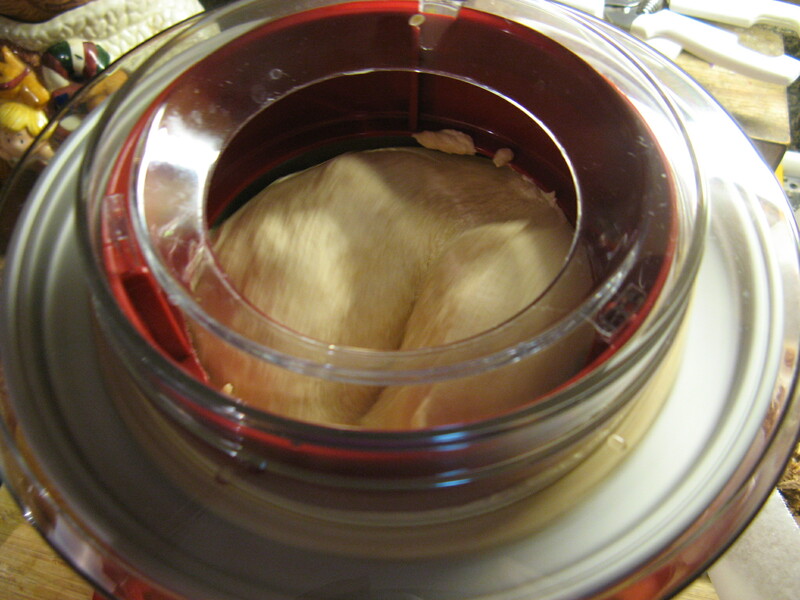 The following day I poured the pumpkin mixture into the bowl of an ice cream maker and allowed it to churn for about 15 minutes – until the mixture was thickened. Ideally I wanted the ice cream to have a firmer consistency so I transferred it to a ice cream container and placed it in the freezer. And after a few hours it was perfect! Combine all the ingredients in a bowl and using a handheld mixer mix all ingredients until sugar is dissolved. Cover the bowl tightly and refrigerate for a few hours, or overnight. 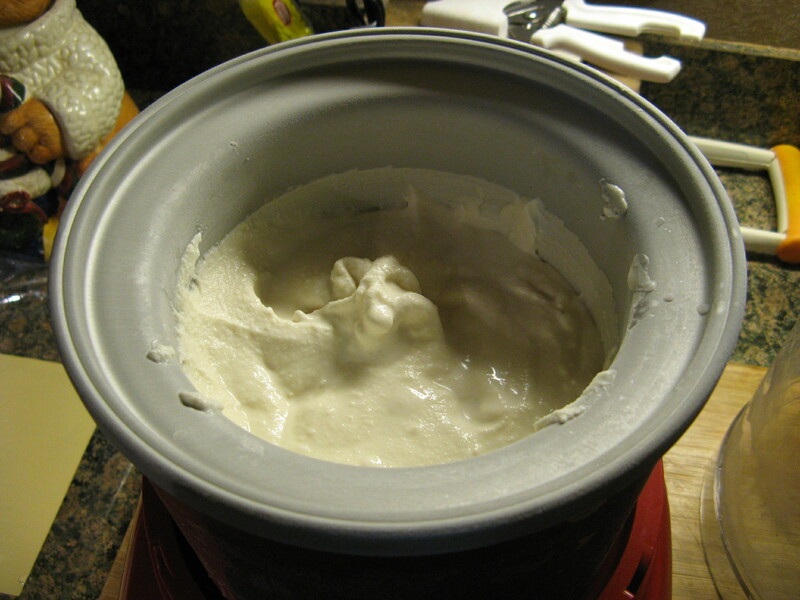 Once the mixture is cold enough follow the instructions for your ice cream maker to make the ice cream. It’s officially the first day of summer (YAY!) After the epic snow fall from the past winter the warmer days ahead are definitely being welcomed with open arms – although, I could do without the humidity that those days also bring. By far my favorite seasons are spring and fall. But, I digress. I think one treat that most of us can agree on that is a summer staple is ice cream – I particularly can eat it in the dead of winter with no problem though. Hence, me wasting no time in churning out a few batches of ice cream back in January soon after getting my Cuisinart Ice Cream Maker. A week or so ago while I was doing something on my computer, maybe working on a blog post, I came up with the idea of Lavender Vanilla Ice Cream. I have plenty of dried lavender left over after making Lavender Cupcakes back in April, which is sitting in a container on my counter right in my field of vision while I am cooking so it’s no wonder that it has been on my mind. You always see lavender and vanilla combined in all sorts of home items so I figured that melding the two flavors together in ice cream should be a winner – and fortunately I was right! 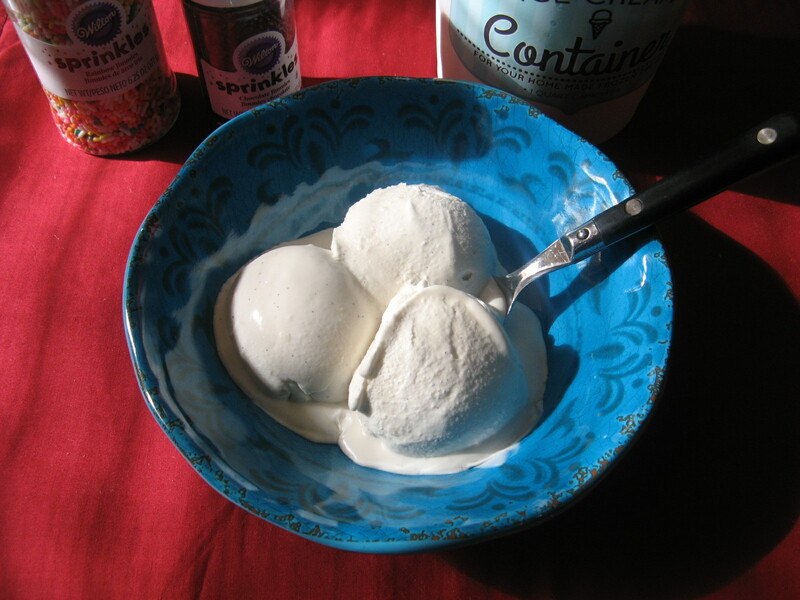 To create the ice cream I followed a recipe for Simple Vanilla Ice Cream with one simple modification. I soaked three tablespoons of dried lavender in the one cup of milk the recipe called for for about six hours – this is exactly what I did to get the lavender flavor for the cupcakes. Following that I strained the milk using a fine mesh sieve and then continued with the recipe. Combining the milk with sugar, salt, heavy cream and vanilla paste (I substituted this for vanilla extract to get that authentic vanilla bean flavor along with the black specks of ground vanilla beans.) 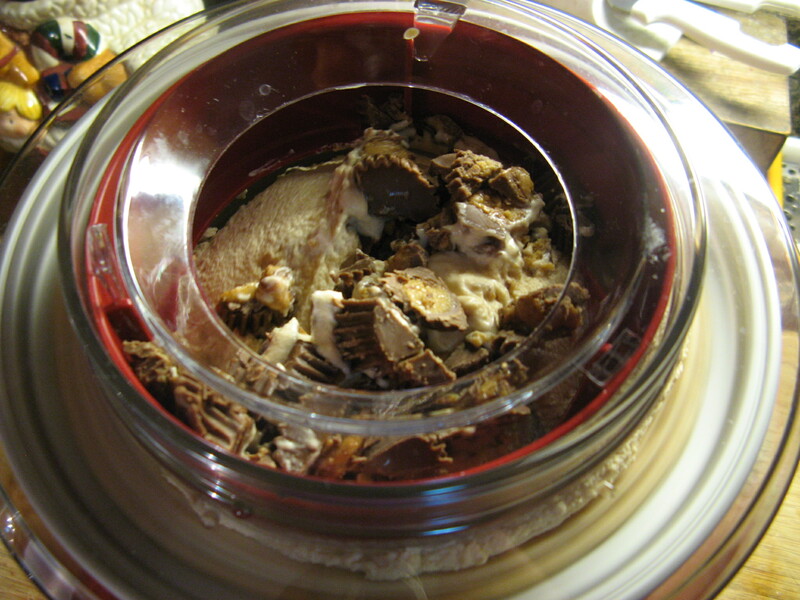 I refrigerated the mixture overnight and I poured the mixture into the ice cream maker and let it do all the work. And about 20 minutes later it was done! 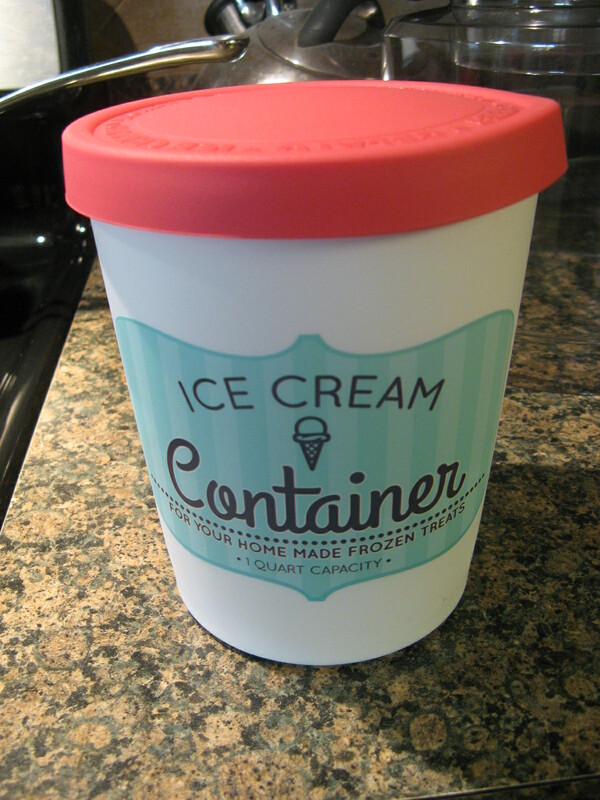 I wanted the ice cream to have a firmer consistency so I transferred it to this nifty ice cream container that I recently picked up at my local Home Goods and placed it in the freezer for about another hour or so. Of course I did a quick taste test before freezing it and was very happy with the results. After sitting in the freezer for a bit I was finally able to enjoy a nice bowl of my Lavender Vanilla Ice Cream! Below is the original recipe for Simple Vanilla Ice Cream and the modifications I made to create Lavender Vanilla Ice Cream. 1. In a medium bowl, use a hand mixer on low speed or whisk to combine the milk, sugar and salt until the sugar is dissolved. Stir in the heavy cream and vanilla. Cover and refrigerate 1 to 2 hours, or overnight. 2. 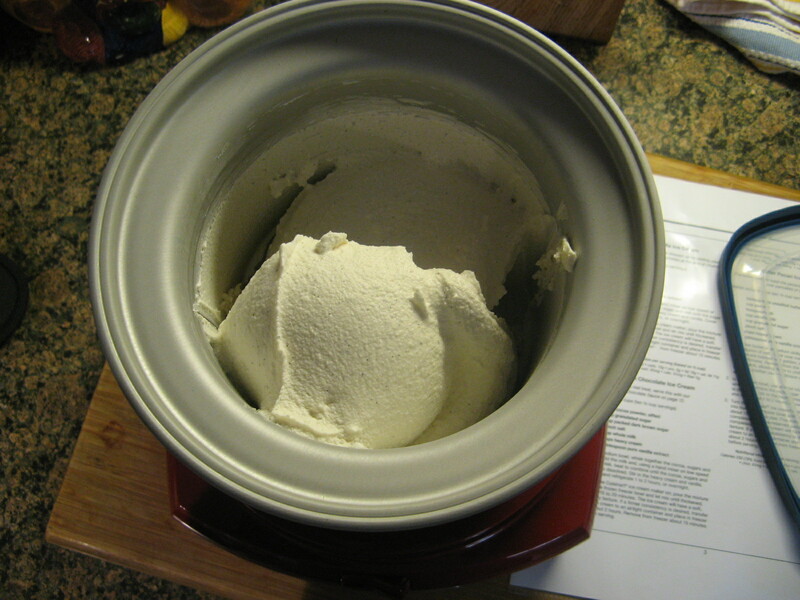 Turn on the Cuisinart ice cream maker; pour the mixture into the frozen freezer bowl and let mix until thickened, about 15 to 20 minutes. 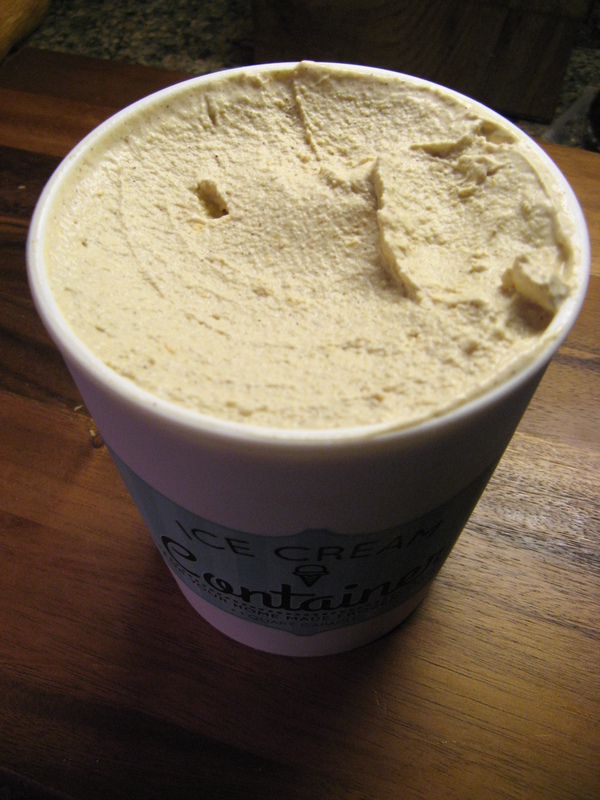 The ice cream will have a soft creamy texture. 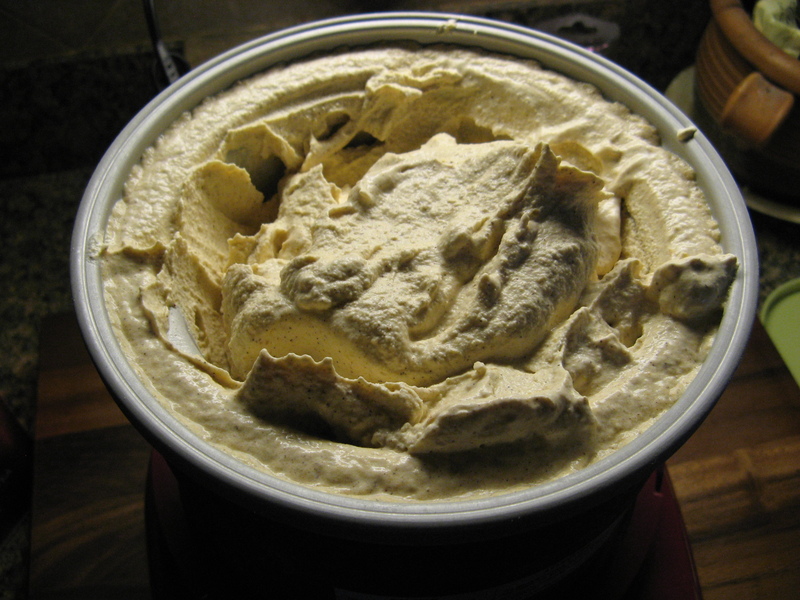 If a firmer consistency is desired, transfer the ice cream to an airtight container and place in freezer for about 2 hours. Remove from freezer for about 15 minutes before serving. Soak 3 tablespoons of dried lavender in the milk for 6 to 8 hours in the refrigerator. Following that strain the milk through a fine mesh sieve and continue with the recipe substituting vanilla bean paste for the vanilla extract. Happy New Year! I figure it’s not too late to say that as we are barely halfway through the month. I hope you all had a wonderful holiday season and that the new year is treating you well thus far. 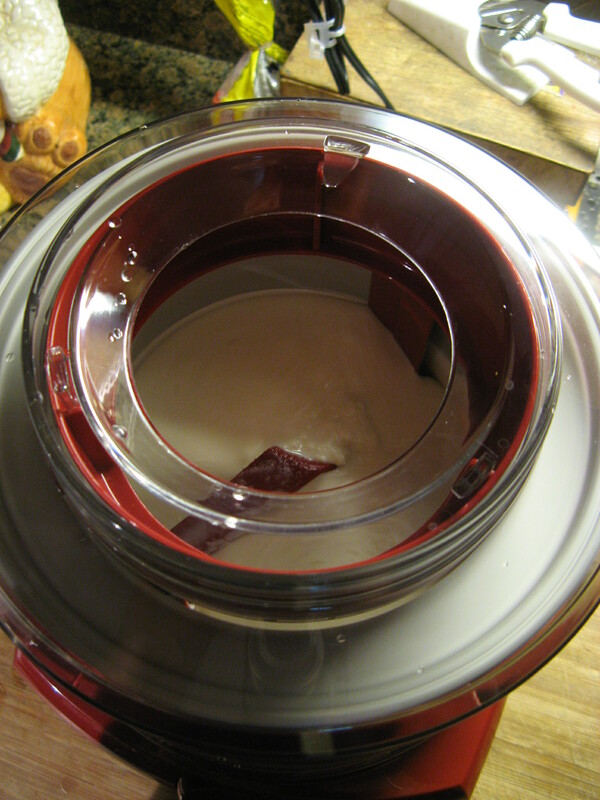 For my first post of 2014 I’d like to share with you some cold and creamy treats I made with my newest kitchen “toy” – an ice cream maker. I absolutely love ice cream and have always wanted an ice cream maker but it never really seemed practical to own one – especially since there are so many delicious flavors on the market thanks to Haagen Dazs and Ben & Jerry’s. 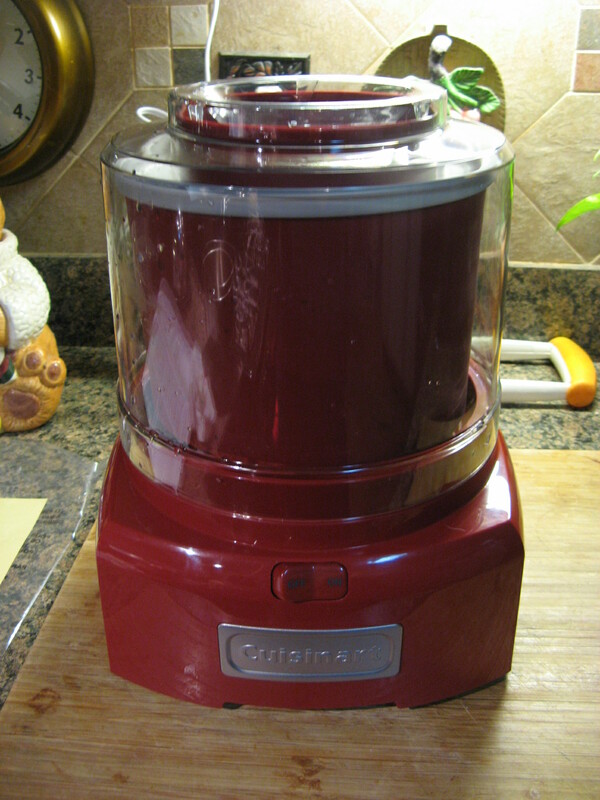 But, then I got a daily deal email from Williams-Sonoma featuring a Cuisinart Ice Cream Maker at an unbelievable price that had decent reviews so I figured why not… Merry Christmas to me! 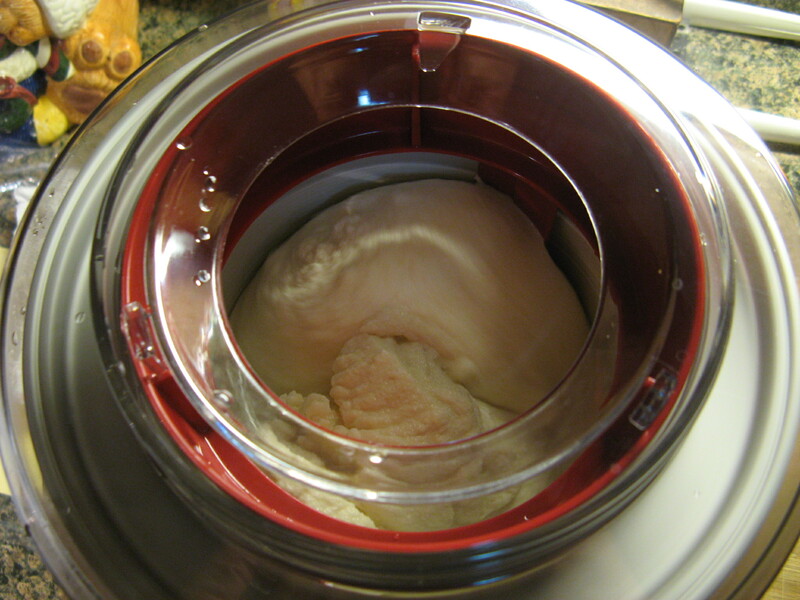 I decided to stick with something basic and simple the first time I used it – Vanilla Ice Cream. After refrigerating a mixture of whole milk, sugar, salt, heavy cream and vanilla extract overnight I poured it into the bowl of the machine and let it do all the work. Within minutes the ice cream was coming together. After about twenty minutes I had homemade Vanilla Ice Cream which went perfectly with a homemade Apple Pie a friend’s mom made. 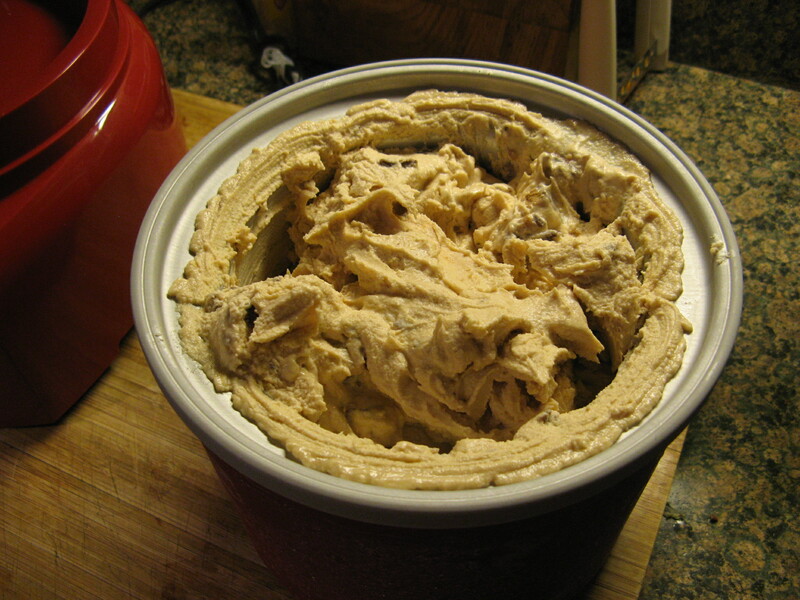 For my second batch of homemade ice cream I decided on Peanut Butter Cup Ice Cream – an ice cream with Reese’s Peanut Butter Cups, how could it not be good? 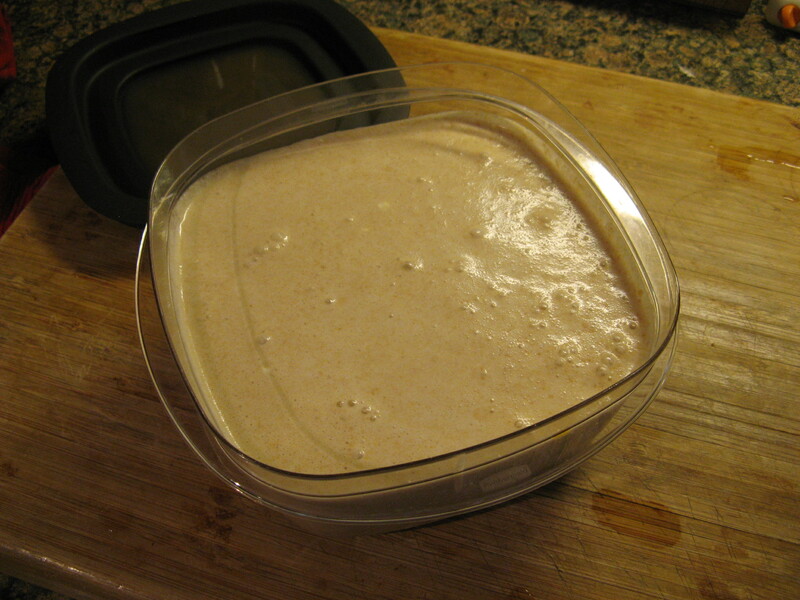 To begin I mixed together peanut butter, sugar, whole milk, heavy cream and vanilla extract and then poured it into a Tupperware container and refrigerated it overnight. 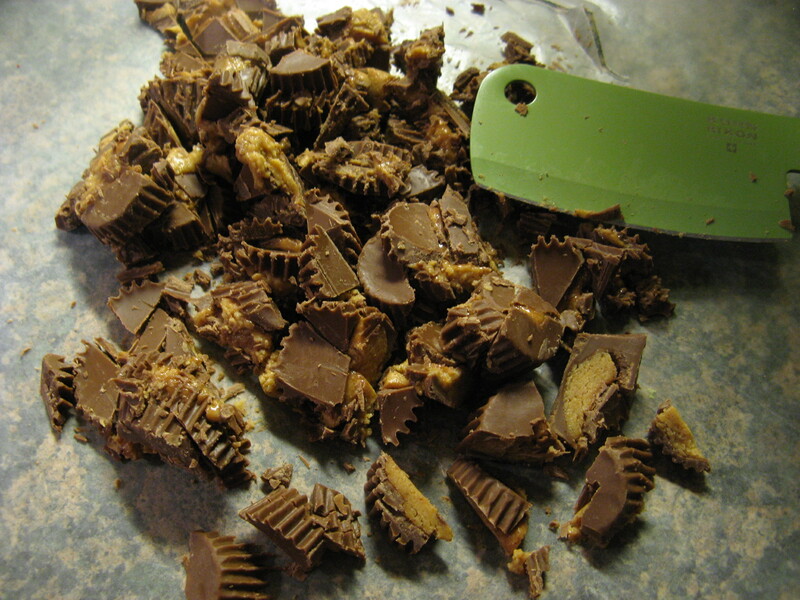 The next day, before starting on the ice cream, I chopped up fifteen miniature Reese’s Peanut Butter Cups to add into it. 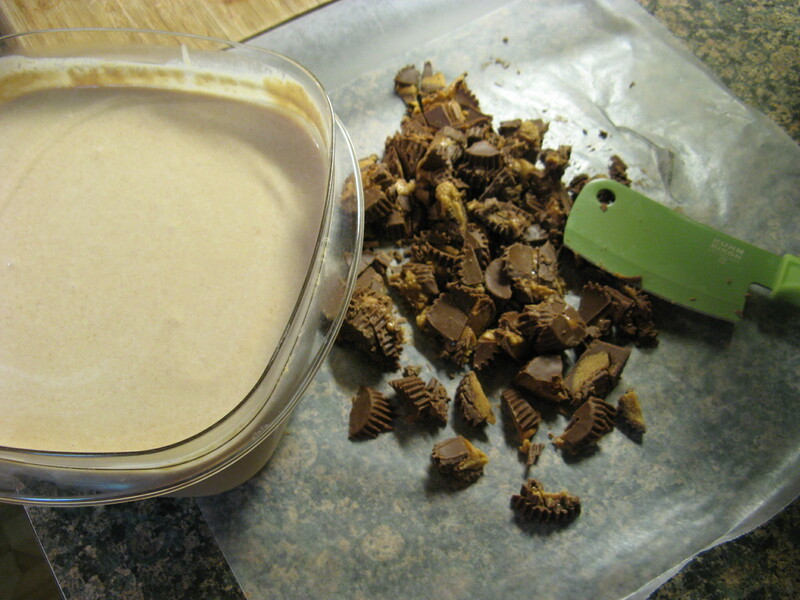 I poured the peanut butter mixture into the machine and let it run for about fifteen minutes before adding in the chopped up peanut butter cups. After running for an additional five minutes the ice cream was done and it was even more delicious than the vanilla one! Overall I’m loving my new toy… clean-up is a breeze and I always leave the two mixing bowls in the freezer so I never have to worry about them being ready to use. If you’re wondering where I found the recipes for these two ice creams, the machine actually came with a recipe book that I am definitely making good use of. Granted, the machine can be a tad bit noisy, as I did read in some reviews, but, it’s not loud enough to make you not want to use it!